Last update discussed the potential pattern in BKX, and that the bear options had to be given at least even odds. And now we may have to go one notch further and shift preference to the bears here. 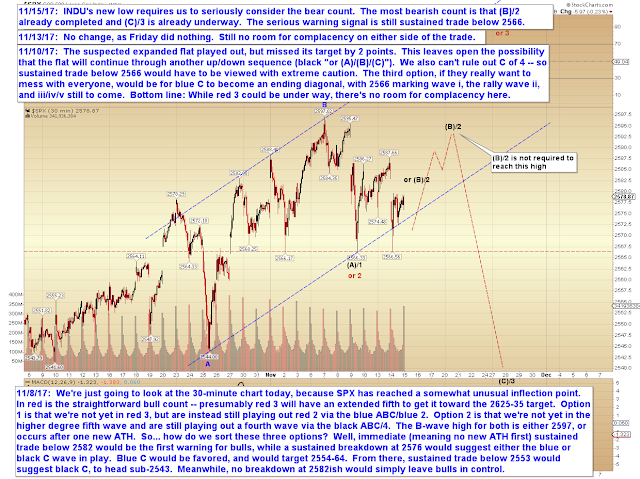 INDU made a new low yesterday, so the only way its downward decline could be complete is if it's a double-zigzag. 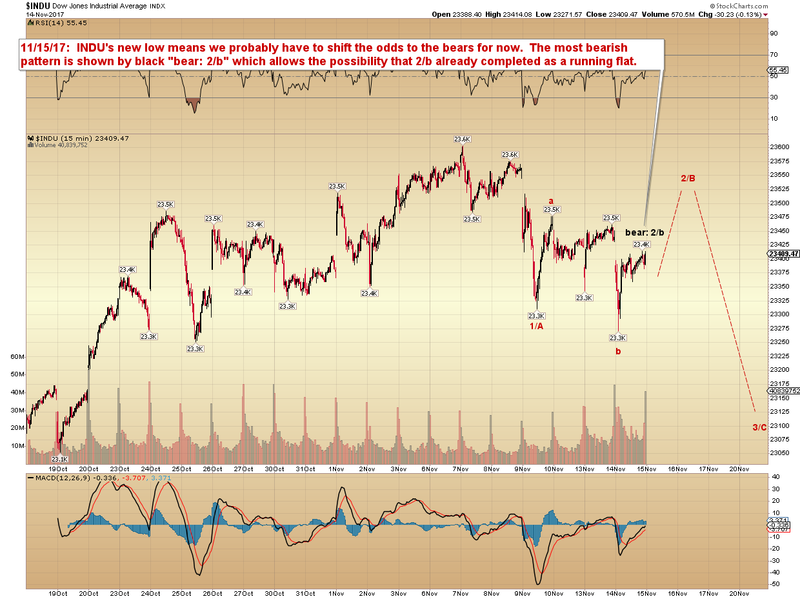 So, it's not impossible for bulls to hang on here, but the new low makes it less likely. In conclusion, while I've drawn rather specific paths on the two charts above, I do want to caution readers against becoming too attached to those paths. We have been in an extended chop zone for a month now, and predictions drawn from chop are the hardest to make, and the most likely to fail. 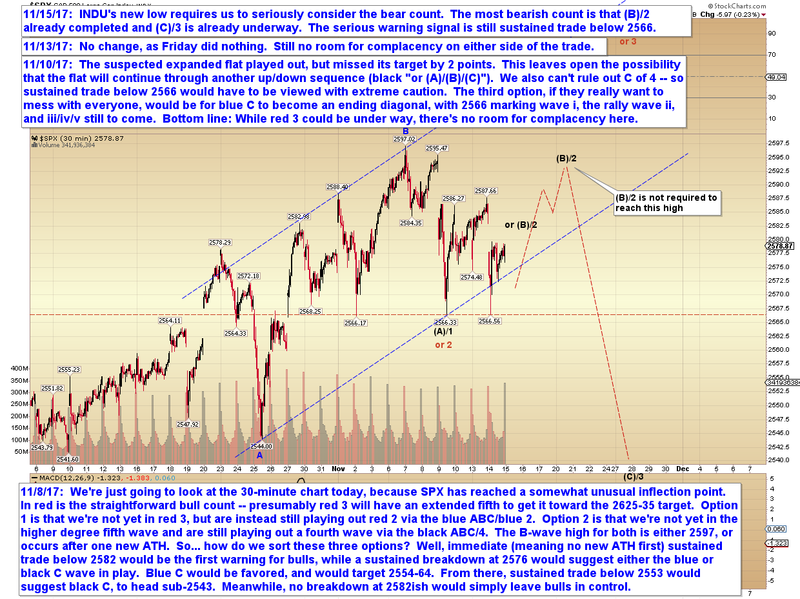 That said, I will commit to saying that I think we have to tilt the balance to the bears for another leg down. The nice thing is that if we get the rally shown on the charts above, there will be a low-risk entry zone in the near future -- and given that we're hoping black (2)/B will put in a decent near-term rally, an invalidation (if it's not (B)/2) won't cause too much pain. In the event the market continues to rally past the black (B)/2 on the above charts and makes a new all time high, then such a move could still be part of black B, but (2) would be off the table. Conversely, in the event that yesterday's low fails immediately, then we have to stay aware that (B)/2 could already have completed as a running flat -- though the ultimate head-trip would be for a breakdown that then rallies up to (B)/2 before dropping for real. And I wouldn't put that past this market at all. In any case, the downside potential for this pattern currently stretches as low as 2480-2500, though will likely have to be adjusted once we see where the final high for (B)/2 actually is -- if that's indeed what's unfolding. Trade safe.